Wait, weren't we just here? Well, sort of. 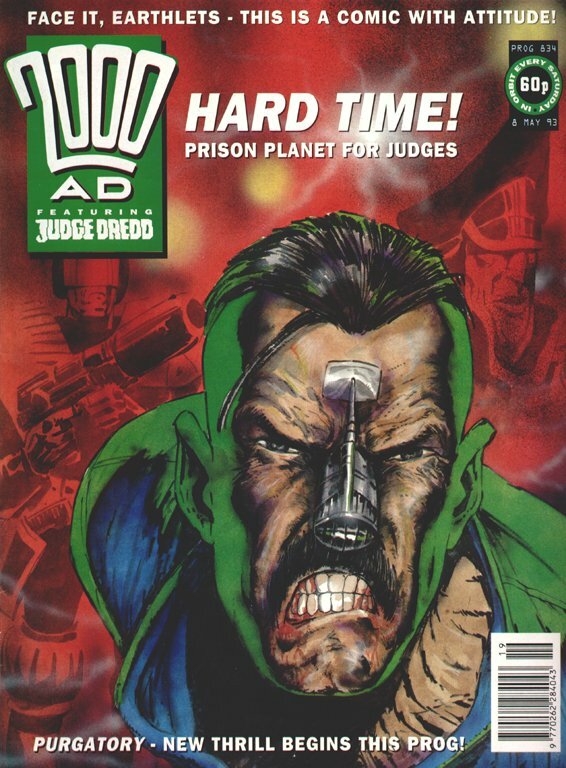 Grant Morrison and Carlos Ezquerra's "Inferno" was reprinted in The Complete Case Files 19, but current British readers had to turn to the supplement included with Megazine #321 to get its prequel, Mark Millar and Ezquerra's "Purgatory." America now gets this volume, with a handful of the biggest names in contemporary comics splashed across its cover. You know, this kind of thing gives young people the wrong idea. That said: "Purgatory" is actually not quite as awkward as "Inferno." I mean, it's stupid--it wouldn't be a mid-'90s Mark Millar story if it weren't. The not-very-cleverly named Khurtz being run through with an electric saw, then thrown into a pit of molten slag--and resurfacing four pages later with his uniform slightly scorched--is the point at which eyes cannot be restrained from rolling. Grice, in the meantime, has melted the flesh off his left hand, but declares "it'll heal." And indeed it does, by the time of a scene that happens less than fifteen minutes later. But honestly, it's really just an over-the-top prison-break story--Harry Twenty on the High Rock, except that absolutely everyone in it is despicable--and it's pitched up so high that it really is sort of thrilling. It's also (and please correct me if I'm wrong here) the final appearance to date of my favorite minor Dredd character, ex-Judge Degaulle, from "The Executioner," "The Interrogation" and "Twilight's Last Gleaming." She's written out very quickly after the second chapter--the last we see of her is when she's screaming at Kaufman to help her, and I don't believe she turns up in "Inferno" at all. The story implies fairly strongly that nobody from the Titan penal colony lived through the explosions in the final chapters of both parts. But Titan seems to have been up and running by the time of "Wilderlands," not much later, and if Degaulle did survive... hmm, her twenty-year sentence would have ended right around Chaos Day, wouldn't it? Also, you know, Carlos Ezquerra means it can't be all bad. (The panel excerpted for the title page of this edition is a particularly wonderful drawing, with one of the prisoners apologizing to the guard he's throttling, an appalled/helpless expression on his face.) Millar really is skilled at giving Ezquerra some of the things he's good at drawing--explosions, ugly people, berserk levels of violence. The American edition is filled out with a couple more Millar-written one-offs--a Christmas episode that Ezquerra seems to have phoned in, and "Top Gun," on which Ron Smith does his level best with a script that demands a lot of detail and is still kind of dumb. 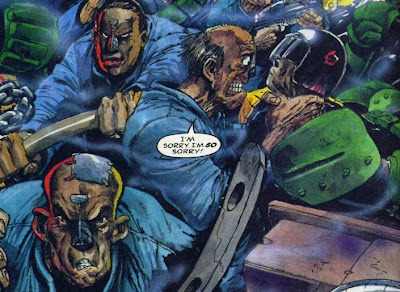 One panel sums up most of what I dislike about the Millar era of Dredd: he dismisses the new Lawmaster design with an "it looks okay"--and then a caption pounds that in with a touch of contempt for the readers: "Nothing impresses Judge Dredd!" Next week: another catchall collection, Mega-City Masters 03. I love the Pinochetesque look of Khurtz and the rest of the art but that merely proves los españoles Ezquerra really is the 'el salvador' here. Inferno and Purgatory will go down in history for me as the storyline that drove me away from 2000AD. I find it to be infantile sadistic nonsense. I picked up Megazine #321 at the San Diego Comic Con this year. 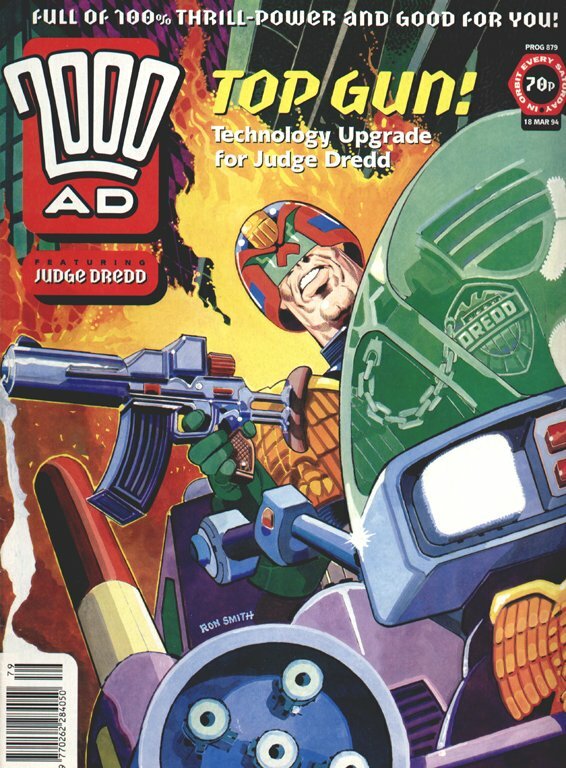 Been a few years since I've read Dredd, so this was all new to me. Pretty damn good, IMHO! Has me looking forward, even more, to the IDW Dredd title coming out this year. Also, psyched for the film.